This enjoyable trip transportation is by local sightseeing tour company with driver guide and by AMTRAK Long Distance train . Our customers like this arrangement instead of whole trip by bus. San Francisco to Monterey. Pick up from your hotel around 8:30 a.m. Departure by 9:00 a.m. Driving via Half Moon Bay or through Silicon Valley to Castroville. See miles of artichoke and strawberry fields with beautiful views of Monterey Bay. By midday stop at Cannery Row allowing time for lunch. 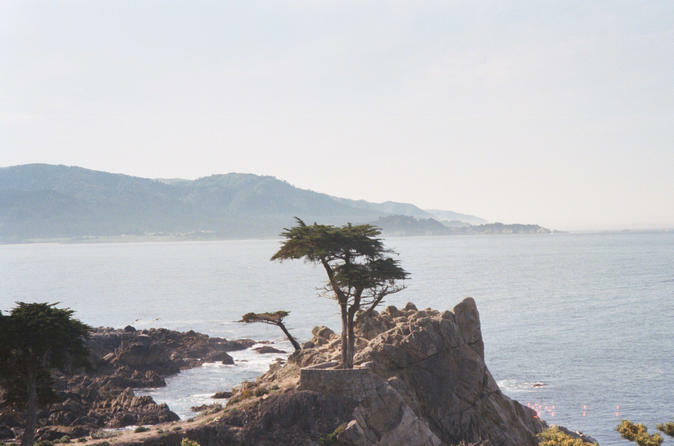 Drive along the seaside flower gardens of Pacific Grove to 17 Mile Drive. See the ocean crash on shore and mansions and golf courses. Stop at Pebble Beach. Continue to Carmel by the Sea, the idyllic village with its art galleries and cottages set in Pine trees. Arrive at your hotel by 5:30. *Red Lion Hotel, Monterey. After a relaxing morning, at 10:15 Sal's taxi (prepaid) transfers you to Salinas Train Station. This takes about 30 minutes. AMTRAK Train #11 that started in Seattle the day before now takes us through the Salinas Valley, center of Monterey Country's agricultural region. The route takes us by Salinas River through small towns, fields of lettuce, broccoli and acres of green houses. Suddenly by King City we see miles and miles of newly planted vineyards where just a few years ago there was only cattle pasture. The oil fields appear and then the military installations at Camp Roberts. Soon we reach historic Paso Robles. Leaving the level areas we now climb Cuesta Grade and drop down to sea level at San Luis Obispo. The ocean briefly appears at Pismo Beach. Heading south the rails go by Vandenberg Space station and near Goleta you see some of the most scenic ocean views all the way through Santa Barbara to Oxnard. Turning inland in early evening the train goes past miles of orange groves then through Fillmore and Simi Valley to Glendale and the great metropolis of Los Angeles. It is now about 9:00 p.m. as we arrive at the in the heart of Los Angeles at the Union Station that you may recognize from many Hollywood films. If you are staying in Los Angeles taxicabs to downtown locations cost about $20, twice as much to Hollywood, West Los Angeles, and Beverly Hills or to Los Angeles International Airport. If you are going further south the train connects to Surfliner #794 at 10:05 that arrives in Anaheim at 10:51.